Jan, sounds interesting. IÂ´m waiting for the result. DonÂ´t worry. We will have fun anyway! Have my bumpers and windscreen still not painted and no roll bar fitted. Hope that will be finished for Moke 50. Moke is now ready for the RC race in Luxembourg! I have not read this thread yet, so I might be repeating somethings? This is my second r/c moke built circa 1989, it was based on a Tamiya boomerang, but converted to front wheel drive! My first attempt was the infamous prisoner moke model built circa 1987 and based on the Tamiya lancia rally car, now owned by Paul Beard. 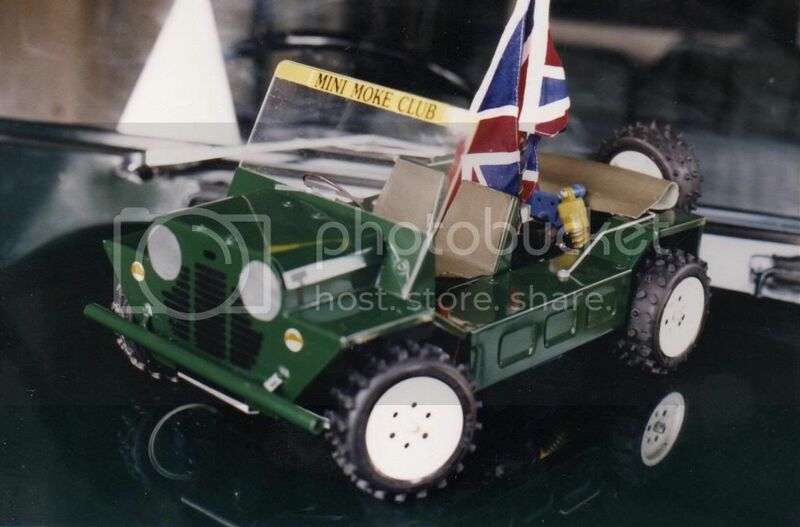 I might be wrong but I believe these pre date other moke r/c models? just found this from Portmeirion. Where can I buy a Moke rc shell? Sorry, but the above shells are no longer available. I was in contact with Christoph Hoffmann (the guy who made them) last year after the IMMM. He wanted to check a remake but I never got a positive feedback. So the above ones were really the last ones. I believe the only chance is to make a shell out of thin sheets of plastic or metal.